Demand for buses worldwide is forecast to rise 4.9% yearly through 2021 to 623,000 units. The largest sales gains through 2021 will be registered by the Asia/Pacific region. CNG/LNG, electric and hybrid types will take share from diesel and gasoline buses. The motor coach segment will see the largest gains in unit terms through 2021 as private bus operators shift away from using more basic buses. This Freedonia study presents historical production, trade, and demand data plus forecasts for 2021 in unit terms. Bus demand is also broken out by product and fuel type. 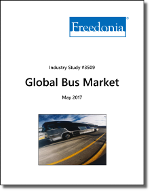 The study also evaluates company market share and shows bus sales in unit and dollar terms for major industry competitors, including Anhui Ankai Automobile, Ashok Leyland, Blue Bird, BYD, CNH Industrial, GAZ, Hyundai, Marcopolo, Navistar, Tata Motors, Toyota, Volkswagen, Volvo, Xiamen King Long Motor, and Zhengzhou Yutong Bus.